Product Claim: Christophe Robin’s new temporary color gel is an effective solution for a custom natural color. It is the result of five years of formulations, tests and adjustments, to obtain the perfect balance between effectiveness, gentleness and a natural result. This direct hair color coats the hair fiber with color pigments without modifying the hair’s structure. It immediately covers grays and adapts to the natural hair color. Each shade blends into the base for a subtle, natural-looking result. the color then evenly fades each time the hair is washed, hence avoiding the vicious circle of the root effect. 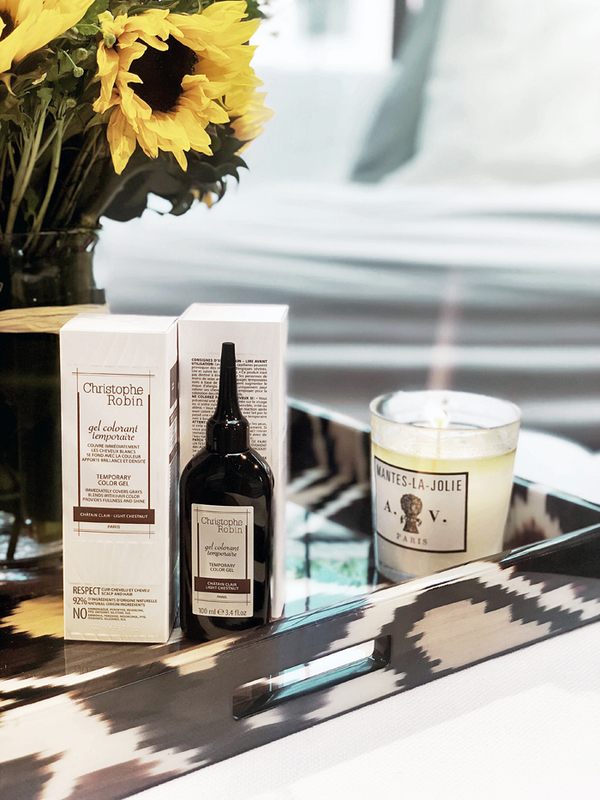 1.Wash hair with a silicone-free shampoo such as Christophe Robin’s Brightening Shampoo with Camomile and Cornflower, the Purifying Shampoo with Jujube Bark Extract or Hydrating Shampoo with Aloe Vera to prep the hair. Do not use any hair masks or conditioners. 2. On towel-dried hair, apply the color gel. If covering only a few grays, use the applicator brush for a targeted and natural result. Otherwise, apply it evenly throughout the hair. 3. Leave on for 40 minutes. 4. To rinse, add a small amount of water, then emulsify by massaging the scalp to help remove excess product. Rinse thoroughly until the water runs clear. Do not wash your hair after rinsing. *Tip :While using the color gel on the roots or targeted grays, you can apply a mask on your lengths and ends during the leave-in time. Pros: The temporary color is enriched with oat flakes – highly concentrated in protein, amino acids and lipids –, recognized for their protective and anti- oxidant properties for the scalp and skin. The formula contains an extract of inula flower – a plant used in traditional medicine – that preserves and brightens the color, then regenerates the hair fiber by stimulating the production of keratin. The result: soft, shiny and radiant hair. Cons: The major con with this product is fear! My fear of ruining an expensive professional dye job for the sake of going a little bit longer between appointments. I’m by no means a professional colorist nor do I trust myself enough to take the giant leap of faith it takes to color your own hair. Thankfully, Christophe Robin’s most loyal partnering salons and color experts offer this temporary color service in their locations. You can enjoy the opportunity to discover this new product in the hands – and with the advice – of experts. A custom application involving an exclusive gesture dedicated to professionals – a color primer shampoo – offers a more vibrant and long-lasting color.